The Supervisor of Winfield Township is Dona L. Smith. 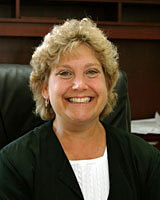 She serves as the Supervisor of General Assistance and the Chairman of the Board of Trustees. The Supervisor is the CEO of the township office and serves as the Treasurer of Town Funds and ex-officio Treasurer of the Road and Bridge Funds. Weed control in the unincorporated areas and Big Woods Cemetery come under the Supervisor’s jurisdiction. The Board of Trustees meets the second Monday of each month at 7:00 p.m. at the township office, except in November (third Monday). The Annual Town Meeting is held on the second Tuesday in April. Most of West Chicago, Winfield and Warrenville are within the boundaries of Winfield Township. Small sections of Wheaton, Naperville, Aurora and Batavia are included. They provide counseling, crisis intervention, tutoring, etc. to township residents. The bus will pick you up at your home and take you anywhere in Winfield Township. Call 630-520-0054 the day before you wish to ride (riders for Monday must call on the Friday before). Calls are taken between 8:30AM and 3:00PM and it is first call, first served basis. You are entitled to three stops and the cost is $4. 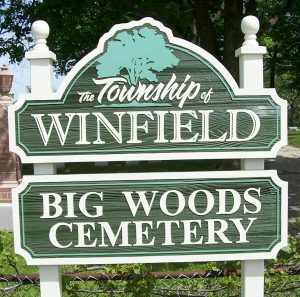 BIG WOODS CEMETERY, located on Eola Road just south of Butterfield Rd, is maintained by Winfield Township. This historic cemetery is the resting place of Israel Warner, who joined the Revolutionary War at age 9 (1777) as a messenger boy and scout until the end of the War in 1783. His father was Seth Warner, co-founder of the famous Green Mountain Boys, with Ethan Allen. Seth is famous for his role in winning the Battle of Bennington, and a statue of him is located next to the monument to the Battle of Bennington. In 1777, Israel Warner carried an important message from his father, a Colonel, to General Stark galloping at top speed during the Battle of Bennington. Israel is buried at Big Woods Cemetery, along with his daughter, her husband, and two of her children, both boys and who both died in the Civil War. We also have seven other veterans from the Civil War, one from the Black Hawk Indian War, two from World War I, and four from World War II. Plots are available for purchase. The price of an adult grave ranges from $1,200 to $1,350; the price of a cremation ranges from $800 to $950, and the price for an infant’s grave ranges from $375 to $450. For more information on Big Woods Cemetery, please call the office at 630-231-3591.